Men's Wedding Rings are Our Specialty! There are hundreds of styles to choose from in gold, platinum, silver, cobalt chrome, palladium, stainless steel, titanium and tungsten. 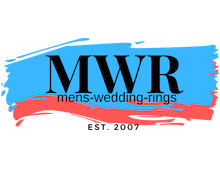 And with the largest selection of mens wedding rings in large sizes 13 through 20, we are certain to have the right wedding ring for every man! Which wedding band is your perfect match? For those seeking a traditional precious metal, platinum, gold and palladium are always timeless choices. If you want an alternative material that offers superior strength, consider titanium, tungsten or ceramic. Do you want a classic white metal look at a contemporary price? Cobalt chrome, silver and white tungsten rings are all excellent options. If you're looking to save, check out stainless steel, but if it's luxury you want, diamonds are an ideal finishing touch to any band.